Lot Detail - Samuel Francis Smith Original Handwritten "America"
Samuel Francis Smith Original Handwritten "America"
Samuel Francis Smith (1808-1895), American Journalist and Author. 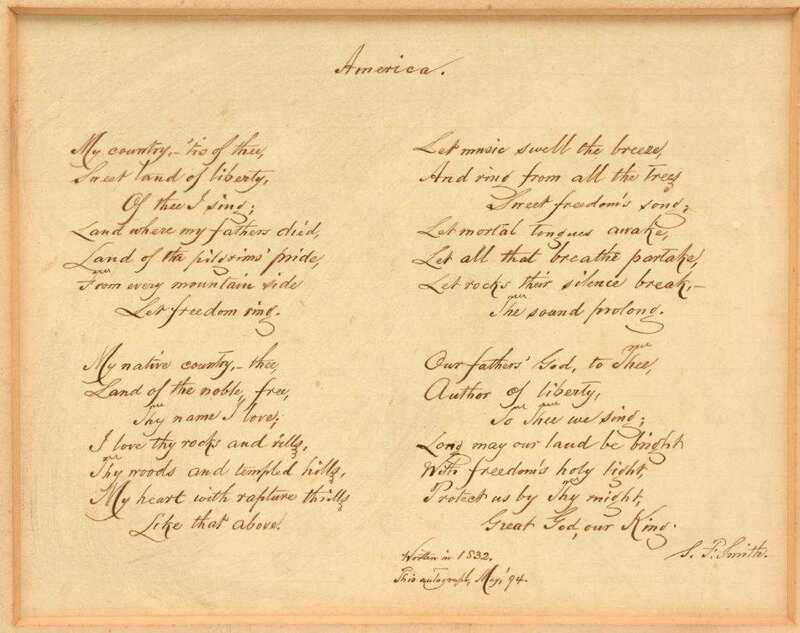 Hymn "America", "My Country, 'Tis of Thee". Smith’s stirring patriotic song, set to the same melody as the British national anthem (’God Save the Queen’), served as a de facto national anthem for much of the 19th century. AQS on one off-white 10 x 8 sheet, signed at the conclusion “S. 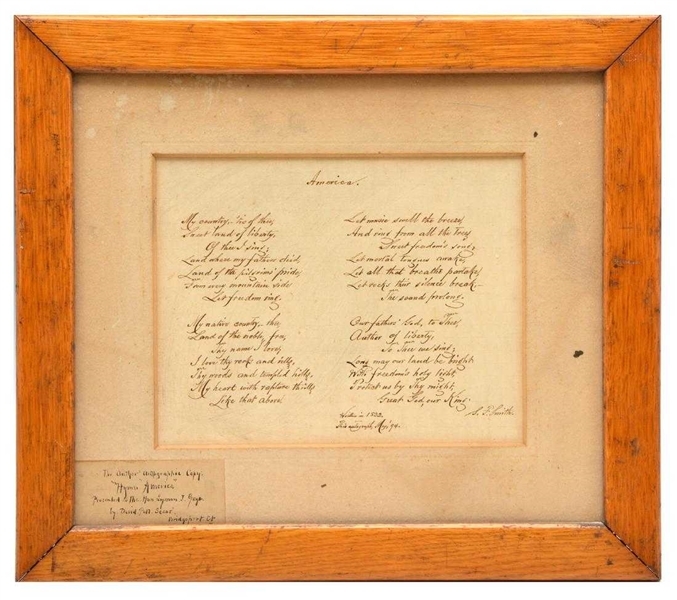 F. Smith, Written in 1832, May, 1894.” Smith pens all four stanzas of “America.” In part: “My country, ’tis of thee,/Sweet land of liberty,/Of thee I sing;/Land where my fathers died,/Land of the pilgrims’ pride,/From every mountainside,/Let freedom ring…. 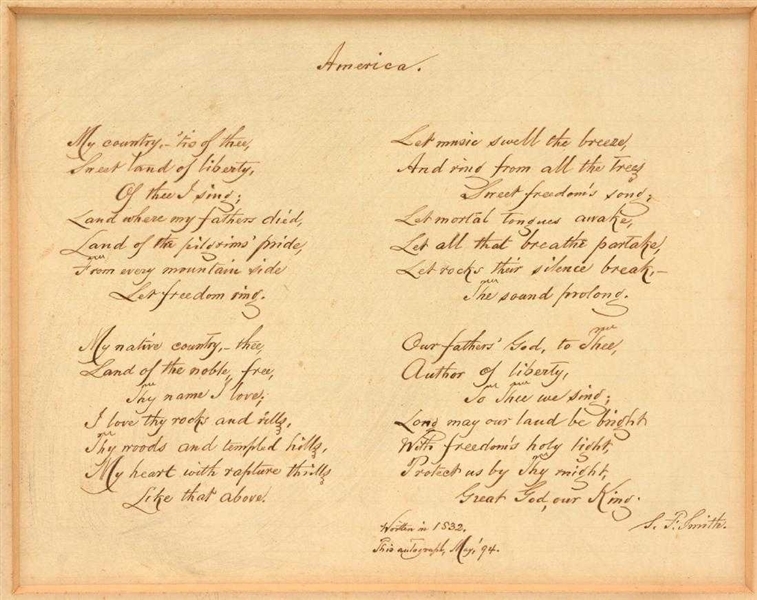 Our father’s God to Thee,/Author of liberty,/To Thee we sing./Long may our land be bright,/With freedom’s holy light,/Protect us by Thy might,/Great God our King.” Written presentation lower left: "The Author's autographic copy: Hymn America" presented to the Hon Lyman J. Gage by David Pell Secor, Bridgeport Ct.". Frame size: 14 3/8" x 16 3/8".Rare to have all 4 stanzas.